Is there a blacksmith in the house? A blade, once broken, reforged! It's probably the Sword of Plot Advancement or Infinity +1 Sword, but it could also just be the hero's signature weapon, if it got broken somehow. In reality, going through something like this would weaken the integrity of a blade, if it is possible at all (realistically "reforging" a blade would be melting down and recycling the metal as well as adding some new metal if you want a same sized blade, effectively making it a new sword, which might be handy for Unobtainium). In fiction, they might actually come out of the reforging STRONGER than they went in. If the sword was broken "in ages past", you may have to hunt down each individual fragment separately in order to put it back together, which makes them Plot Coupons if it's for the Sword of Plot Advancement. You may also need to track down some "legendary smith" to do the actual forging. Overlaps with Wrecked Weapon in several places. Contrast Like Cannot Cut Like. In Mobile Suit Gundam SEED Astray, Lowe Guele's Gerbera Straight is broken by Rondo Ghina Sahaku, so he returns to the Hermit Guru who crafted it in the first place. Instead of reforging it himself, the old man teaches Lowe how to do it because he knows he's going to die soon and wants his craft to live on in a worthy successor. In a subversion, the repaired Gerbera is just that — repaired — and not made anything really amazing. On the other hand, Lowe uses his knowledge along with a giant hunk of Thunderbolt Iron to forge a 150-meter-long Gerbera Straight which can only be wielded by his Gundam's Meta Mecha. Guts' Dragonslayer in Berserk is never actually broken, but still takes a great amount of stress and damage after two straight years of Demon Slaying. Godot therefore has to repair it. The Tessaiga is broken by one of Naraku's incarnations, then reforged. This actually follows a somewhat more Applied Phlebotinum version of realistically needing to add more material, as while the first sword was made from Inuyasha's father's fang only, The Blacksmith needed Inuyasha's own fang to reforge the sword. Because of this, Inuyasha had to rely on his own power to wield the sword, while beforehand he was relying on his father's power, effectively riding daddy's tail. Since Inuyasha's power was inferior to his father's, this initially rendered the sword so heavy it was difficult to wield. Also Sesshomaru's Tenseiga is reforged into a fighting weapon because of Sesshomaru's feelings for Kagura, but it's never clearly stated exactly what those feelings were. He then vows over the sword to make sure that she hadn't died in vain. During a battle with a bone-eating demon, Sango had to deliberately coat corrosive poison on her Hiraikotsu in order to trick the demon into swallowing the poison (it's made of bones so he wanted to eat it), since Miroku couldn't simply absorb the demon with his Wind Tunnel. She then took the melted boomerang to a poison master to purify and repair it. The demons whose bones comprised it were none too happy that she would sacrifice them despite all they'd been through, but seeing Miroku's resolve convinced them to work with her again, not only reforging the boomerang but giving it the ability to cut through demonic energy. This is the special power of Kubikiri Boucho ("Decapitating Carving Knife") in Naruto. Even if it's broken, it will always be remade... because it actually absorbs the iron from the blood of its victims to repair any damage it suffers. This also invokes Artistic License  Physics, as the average human being has enough iron in his body to make one nail. You'd need to kill a lot of people to get enough iron to repair a sword that big if it gets significantly damaged. Considering the mindset of the swords wielders and their origin this may in fact be completely intentional. Pretty early in Rave Master the Ten Commandments broke. They brought it to the smith who forged it originally, "Musica," the old one. The sword is stronger thanks to advances in technology. Reforged again by "Musica", the young one, toward the end of the series. Samurai Troopers (aka Ronin Warriors) has a truly bizarre reforging scene. In it, Ryo climbs inside Mount Fuji and throws the broken blades of his Rekka-ken into the magma. The volcano erupts, and Ryo catches some of the magma on the broken hilts, which forms itself into new blades. In Bleach, Ichigo's Zangetsu is reforged with an Asauchi base and manifests as two swords that represent his Shinigami and Quincy powers. In the second season of the Magic Knight Rayearth anime, Hikaru's Escudo sword is broken by Nova. Because Escudo is a magic mineral, Hikaru and Presea have to undertake a Journey to the Center of the Mind to "resurrect" it. Although it's not explicitly stated to be more powerful, Hikaru comes out with a stronger will and starts using Sword Beams with it. In the first episode of Hyper Police Natsuki finds an Orichalcum sword and manages to break it shortly after. So she goes to a swordsmith, who tells her it would be too expensive to reforge so she just has it ground into a dagger. Implied in Lupin III: Goemon's sword has been broken on occasions, but next time it's whole again. In the manga version of Sailor Moon the protagonist's Eternal Tiare gets broken during her battle against the brainwashed Sailor Senshi, but she easily repair it after obliterating the enemies with the still broken sceptre. In The Broken Sword by Poul Anderson, the eponymous sword is a major plot point: it's a doomed sword of evil doom. Skafloc (the protagonist) travels to the edge of the earth to get it re-forged by epic giants. It's a weapon that makes its wielder almost invincible in battle, but once it's been drawn, it has to taste blood. Ultimately his own. The Dresden Files: In Skin Game, Fidelacchius, the Sword of Faith, is broken by Nicodemus when Murphy tries to use it in rage, leaving just a hilt. At the climax of the book, Harry tries to throw it to Charity Carpenter, but it instead lands in the hand of nerdy coroner Waldo Butters — and, because of Butters' deep faith in his friends and the morals of Star Wars, the sword is reforged . . . into an honest-to-God holy lightsaber. Even the Archangel Uriel is forced to admit he didn't see that one coming. At one point in the His Dark Materials trilogy of books, Iorek has to reforge the Subtle Knife when Will breaks it, although Will is warned that it won't be quite as strong again. In The Lord of the Rings, there was Narsil, sword of Elendil, which was shattered in the Siege of Barad-dûr — but the hilt-shard cut the One Ring from the finger of Sauron, thus winning the war. Much later, they were reforged for Aragorn's use and renamed Andúril. He never really DOES much with the sword, but since it serves as a symbol of his status as the Returned King, and since the reforging was part of a series of prophesied events leading up to the final fall of Sauron, it qualifies as a Sword of Plot Advancement. In the first book, at the moment in Moria when Frodo has apparently been killed by an orc's spear Aragorn uses Andúril to chop through an orc's helmet and skull in one blow. There's even a blinding flash of light when it does. it does this again against a orkish shield wall at helm's deep. Note that in the movies, it's reforged much later than in the novels. In Mossflower of the Redwall series, the book starts with Martin getting his Ancestral Weapon wrecked by Tsarmina, and wears the broken hilt around his neck for much of the story, until it gets reforged (with metal "from a fallen star", no less), and becomes the legendary blade that shows up in the rest of the series. In Saga of the Volsungs, the smith Regin, with the help of the hero Sigurd, reforges the pieces of Sigurd's father Sigmund's sword into the sword Gram, with which Sigurd will later kill the dragon Fafnir. This is very likely the Trope Maker (note that other versions of the Sigurd legend such as the Eddas or the German Nibelungenlied don't have this trope). Richard Wagner repeated this version in his Ring of the Nibelung cycle of operas, and it was also quite unambiguously the inspiration for J. R. R. Tolkien's use of the trope. A recycling variant appears in A Song of Ice and Fire, where the longsword "Oathkeeper" that was given to Brienne of Tarth is one of two swords forged from the Valyrian Steel left by melting down Eddard Stark's greatsword Ice. Lightning, Alanna's sword, in the Song of the Lioness quartet. It was shattered by an Artifact of Doom sword, and no blacksmith could reforge the magical blade. Alanna later came up with a solution and, with a combination of magic and help from a goddess, combined the wrecked blade with that of the sword that destroyed it, reforging it as a new weapon. In The Stormlight Archive, there are hints that it might be possible to revive the dead Shardblades. In particular, Adolin's blade has been able to communicate with him on a rudimentary level, sending him a few vague emotional impressions and even telling him her name, and also appearing in his hand in seven heartbeats instead of the usual ten necessary for a dead blade. Word of God has implied that it is indeed possible but apparently very difficult. In Jennifer Roberson's Tiger and Del series, Tiger's original sword is shattered, but reappears down the road. Tiger's leery about using it because he feels that reforging a broken blade makes a sword more likely to break in the future, and thus, untrustworthy when fighting for your life. Damoren, the holy revolver from Ragnarok Publications's Valducan series was formerly a sword which was broken by demons. The reforging process made it much-much more badass. Xena: Warrior Princess: Xena's chakram had been broken into two pieces and they had been magically reforged into a new weapon that can transform into two blades. In Wagner's The Ring of the Nibelung, episode III (Day II), Siegfried reforges Nothung by grinding the original sword into metal filings, melting it down, and casting it anew. This is, of course, based on the Sigurd legend as told in Völsunga saga. Note that he did all this without the slightest idea of what he was doing. The sword was originally broken by Wotan (Odin) in part I, and in the end Siegfried uses the reforged sword to defeat him. The point is that human instinct (particularly for love) is more powerful than the wisdom of the gods. In Vandal Hearts, one of your main purposes during your quest is to obtain the legendary sword Vandal Heart. However, if you take on a number of subquests along the way - collecting all the Spheres, passing all the Trials, obtaining all the Keys — then towards the end, you can upgrade the main hero, Ash, into the 'Vandalier' class, which makes him virtually invincible and turns the rest of the game into a cakewalk. As part of this transformation, the Vandal Heart is turned into the even-stronger Vandal Heart Reforged. In Vindictus, the friendship sword. The increase in power is justified because the original was one of two made for kids, and Ferghus made them dull so they wouldn't hurt themselves. Exile has a very old-school example in the Demonslayer — a very good (but not Infinity Plus One) sword that is, however, extremely good against Demons — which is important, since one of your main quests is to slay the Demon Prince. In order to reforge it, one must first collect all the scattered pieces and then have it reforged by a famed master smith. Neverwinter Nights 2 has the Silver Sword of Gith, which is reforged near the endgame. Notably, in the original campaign there's still pieces missing (one of which is embedded in your chest). It's not until the expansion that the sword is completed. Chrono Trigger has the Masamune (Grandleon in the Japanese version), which was broken in half and has to be restored to advance in the game, since it's the only weapon capable of harming Magus. In Ultima Underworld, the Sword of Justice needs to be reforged by the dwarven smith, Shak. You must find both pieces of the sword first. In the fourth and fifth Fire Emblem games, you can repair fully broken weapons, and they'll be good as new. This becomes a plot point when Sigurd recieves the Holy Tyrfing from his father. It's broken and must be repaired for an absurdly high cost. The Picori Blade from The Legend of Zelda: The Minish Cap, which is broken, fixed, and eventually upgraded to become the Four Sword. Likewise, the sword upgrade in Oracle of Ages involves reforging a broken blade. Whether it's the Noble Sword or the Master Sword you're reforging depends on if you've played Oracle of Seasons first. The Master Sword isn't exactly broken in Wind Waker, but it's lost its magical power to repel evil, which must be restored by having sages pray musically in the hearts of dangerous monster-infested ancient temples. Done unusually in Skyward Sword, where the Goddess Sword wasn't broken at all, but wasn't strong enough, and so was reforged anyway in three Sacred Flames (and then blessed by Zelda), creating the Master Sword in the first place. The Master Sword in The Legend of Zelda: A Link to the Past is the Trope Codifier for the way it's used in video games (as a way to avert the ludonarrative dissonance of the Sword of Plot Advancement becoming the Penultimate Weapon after being replaced by a better one). It's reforged by a pair of dwarven blacksmiths, and later magically upgraded by a faerie. Fall from Heaven: Age of Ice does this with the Godslayer; indeed, the main point of the 'Age of Ice' scenario is to seek out the scattered fragments of the Godslayer, since only that weapon can bring down Mulcarn, the God of Winter. The actual reforging is passed over lightly, and was apparently performed by Kylorin the Archwizard himself — so presumably, it was magical in nature, rather than involving hammers and anvils. Of course, considering the intense magic held in those shards, it may have just spontaneously reassembled itself when all the pieces were gathered in one place. The first Broken Sword game has the antagonists trying to reforge the eponymous weapon in the belief it will restore their order to glory. The heroes stop them. In Baldur's Gate 2 this is done with several artifact weapons, like The Equalizer and The Wave. Knights of the Old Republic has the Wookiee ceremonial weapon Bacca's Blade. The hilt is with Chuundar, who may be in charge, but is anything but honorable. The blade was broken off in a sacred hunt, and (if the player chooses), can be recovered and given to Chuundar's (and Zaalbar's) exiled father. If you choose this route, the blade will be re-forged, and is one of the better non-lightsaber blade weapons. In League of Legends, Riven the Shattered Exile had a pretty cool sword, but broke it in rage when she found out about Noxus' corrupt government. Her ultimate has her reform it, giving her a large power boost and a shockwave attack. Mehrune's Razor has laid in the tomb of a thief for so long that it has become rusted and unusable. Mehrunes Dagon will send you on a quest to retrieve it, and will then re-imbue it with the power it once had. Wuuthrad, a giant two-headed axe and chosen weapon of the ancient hero Ysgramor, must be reforged in order to complete the Companions questline. The scattered pieces serve as sort-of Plot Coupons. Mehurne's Razor is this once again. This time, it's in pieces that must be found and reassembled at the altar of Dagon himself. The Greatsword of the Wolf Knight Artorias from Dark Souls was lost when he made a pact with the Abyss and was slain by his former comrades. The true divine Greatsword of Artorias can be reforged using a broken sword and the soul of Artorias' most loyal companion the Great Grey Wolf Sif. Alternatively, Sif's soul can "corrupt" a normal sword to reforge the cursed Greatsword of Artorias (the original sword was cursed when Artorias made his pact). The "Artorias of the Abyss" Downloadable Content introduced a third version forged from a fully upgraded normal sword and Artorias' own soul. The Abyss Greatsword's power scales with the wielder's Humanity since the Abyss is essentially Humanity gone out of control. The legendary Northern Regalia from Demon's Souls was split into two swords, Soulbrandt (which becomes stronger if its wielder follows the path of Demons) and Demonbrandt (which becomes stronger if its wielder follows the path of Humanity). The original sword can be reforged using the two swords and the False King's Demon Soul. Also, the Blueblood Sword can only be crafted from a broken sword, and you only find one in the game. At the end of Castlevania: Lords of Shadow and its "Resurrection" Downloadable Content, Gabriel Belmont shatters the Vampire Killer Combat Cross after killing the Forgotten One. Due to background events in Castlevania: Lords of Shadow  Mirror of Fate, it is reforged by the time of Castlevania: Lords of Shadow 2, much to the surprise of its destroyer, as it is the only weapon capable of killing immortals for good, such as Gabriel himself (as Dracula) and seemingly Satan as well. In The Lord of the Rings Online, players can take a long series of quests to help reforge Narsil - the process requires a special gem, (a Silithar) and Aragorn can't be bothered to go get it himself. Also, expansions to the game introduced Legendary Items for players at level 50, weapons and gear which can be customized and improved. They require occasional "reforging," although they don't actually break first. In Darksiders, War needs to find several hidden fragments of the Armageddon Blade, the only weapon in existence capable of killing The Destroyer. The Sulevin Blade was broken into pieces in a magical ritual gone wrong long ago. The Inquisitor can gather the pieces and bring them back to Dagna to have it reforged. The trope is then averted when Dagna explains that she can't reforge the sword with its pieces since metal doesn't heal. Instead, she uses the pieces as inspiration to forge an entirely new sword. The new Sulevin Blade is one of the most powerful weapons in the game. Played straight with Certainty, which is the Red Lyrium sword Meredith wielded. The Elder One reforged the blade using a combination of Elven, Tevinter, and Blight magic and gave it to Samson. Warframe has the War, the sword used by the Shadow Stalker. You get a broken version of the sword at the end of the Second Dream questline that can be reforged into one of the most powerful two-handers in the game if you're willing to give up having one of the best one-handed swords in the game. Frost Death Knights go to Icecrown Citadel and collect the shattered pieces of Frostmourne, and reforge them into a pair of rune swords called "The Blades of the Fallen Prince". Sir Anduin Lothar's sword, the Great Royal Sword, was broken by the Doomhammer when he lost his Duel to the Death with Ogrim Doomhammer. His second-in-command Turalyon took up his fallen leader's broken sword and rallied the Alliance troops to victory. When he returns in Legion, he is still wielding the sword, except he has reforged it by replacing the broken part of the blade with solid Light energy. In Final Fantasy XIV, there's a questline a player can access after beating the initial Main Story Questline for A Realm Reborn where a drunken blacksmith sends you to a location to retrieve a legendary weapon used by the job you talk to him with. When you retrieve it and return to him, you both found out it's in terrible shape and the rest of the questline is spent reforging the weapon to its former glory. Starbound: The very first weapon you start out with is the Broken Broadsword, which deals pretty pathetic damage. Hold onto it to the end of the game, and once you finish the second-to-last mission you can get it reforged into the Protector's Broadsword, which is one of the best weapons in the game. In the first Pillars of Eternity game, it's possible to obtain two powerful swords in the bonus dungeon the Endless Paths Of Caed Nua, the Blade of the Endless Paths and the Whispers of Yenwood. If you import save with the two weapons collected into the sequel Pillars of Eternity II: Deadfire, your ship's cupboard will contain the shattered fragments of the swords. The swords were shattered when Eothas awoke in the adra colossus. By taking the fragments to a certain blacksmith in Neketaka, you can have the swords reforged. The blacksmith will also mention that the two swords' fragments seem drawn to each other, and offers to use all of the fragments to forge an entirely new sword. The result is an enormous greatsword, The Whispers of the Endless Paths. In Dragon Quest III, it's revealed that the Big Bad destroyed the legendary Sword of Kings because it was a threat to him. If one picks up the the pieces of Orichalcum left from the shattering and sell it to the Ultimate Blacksmith, he'll reforge it. The hereditary Greenhilt Sword from The Order of the Stick, which got broken by Xykon during Roy's first confrontation with him. Reforged with Starmetal, it's now a Plus Five Sword, with extra bonuses and neat glowy effects against Undead. Parodied in Oglaf with one of the random quotes at the top of the page. It used to be The Sword that was Broken. Now it's the Sword that Keeps Breaking. An episode of Man at Arms did this on purpose, with the team making Narsil from The Lord of the Rings using improper forging techniques, then having a (female) Sauron cosplayer come in and smash the fragile blade into pieces with a mace so they could re-forge it as Andúril, doing things the right way this time around. In The Adventures of Puss in Boots, Puss' rapier is broken in the fourth season finale, and while its repair happens off-screen, it being returned to him marks the end of a Heroic BSoD he had been having since the battle. In ThunderCats (1985), the Sword of Omens is broken and reforged thrice over the course of the series. In Transformers Prime, the Starsaber is shattered by Megatron's Dark Starsaber. Optimus later uses the Forge of Solus Prime to repair it. In BIONICLE, there is a subversion, in that the Spear of Fusion used by Vezon was broken in half by Reidak. Vezon managed to fix it using the Spear's own powers. Unfortunately, Jaller used his powers to burn it to a crisp when Vezon encounters the Toa Inika again. Played straight, subverted or averted entirely in real life. You could theoretically repair a broken sword (played straight), but it's difficult and usually requires complete reforging of the weapon, meaning that for historic practical use, it may just be easier to get a new one (averted). Averted in the case of one particular weapon in an Oslo museum, which had the tip re-sharpened after the end broke off, as if the owner saw the bill for a sword repair and thought "screw it". 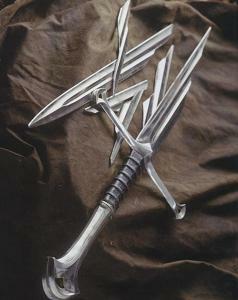 In the Middle Ages broken swords were usually re-forged into daggers or knives. Tantó, literally "short blade" is an example of this. Reforging is a viable option if there's a severe shortage of weapons-grade steel and refining new steel is either too expensive or too time-consuming. That being said, it's still a significant effort and the process of sharpening a new blade will result in some metal loss. Fans of Touken Ranbu have fundraised for the real-life reforging and restoration of swords featured in the game, all important historical artifacts in Japan.